Iaido and Muso Jikiden Eishin Ryu by one of Japans most respected Iaido teachers, Iwata Norikazu Hanshi. Iwata Norikazu Sensei left us on January 1st 2011 at 98 years of age. He himself had written an article on Yoin (Reverberation) in May 2000 talking of the people that had made an impression on him in his life. He talked of great men. But he himself taught unreservedly handing everything he knew. A great swordsman that now will be the Yoin in my life and many, many others that knew him and learned from him. In his inimitable style he related to us the teachings of his teachers and their teacher, adding his own supplements. In general translating and editing Japanese literature is problematic, because contents tend to be rather repetitive. This was not the case with this book. The Green Book was the first one written by Iwata Hanshi. It is essential reading for people starting out on the Jikiden Path. More experienced practitioners will be familiar with some of the contents. However this book officially confirms many facets that have been questionable for so long. As I am sure most readers will know Iaido is the 20th Century name designated to generalizeSword Drawing Techniques produced since the Edo period. As we know some 32 years ago the ZNKR In conjunction with an agreeable group of Iaido teachers devised a set of forms designed to teach Kendoka sword basics called. Seitei Gata Iaido. Within the Z.N.K.R Dan grading system it is an examination requirement up to the level of Yondan (4th Dan). Above this level one proceeds to study Koryu (Classical Style). In introducing Seitei kata is was said that anyone wishing to study Iaido in more detail should join one of the many Ryu. People going to Japan to further their Iaido studies are surprised to find that Koryu is disappearing at an alarming rate and the people possessing superior knowledge of these arts are few and far between. It was Iwata Sensei's predecessors that had formulated Seitei Sadly the kata of Seitei has become so mixed up with the defined waza of Ryu to the extent that very few people are able to clearly separate the two to an efficient degree. The founder of Iai, Hayashizaki Jinsuke Shigenobu. This photograph was taken a a special ceremony when a Budo Shrine was opened. This cannot or should I say should not be seen elsewhere as no one else has had a chance to take this picture. He was a retainer of the Mogami clan Oshu in Ashikaga Era (1336-1576). Oshu is the current-day Yamagata Prefecture in northern Honshu. During the Eiroku Era (1558–69) the school of fencing came to be known as the Ayah School, or the Shigenobu School. 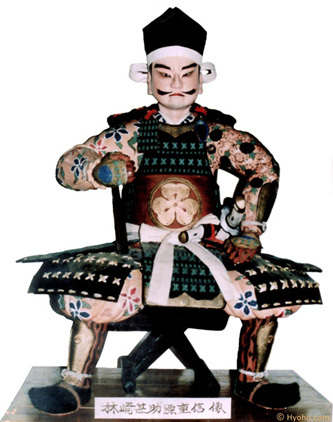 Nearly two centuries later during the Kyoho Era (1716–36), Shuze Hasegawa, a swordsman of unprecedented prowess, fused his unique technique into the art, and changed the name of the school to the Musojikiden Shigenobu School. He established a following in his native district of Tosa in Kochi Prefecture in Shikoku). What remains are mostly Ha or different branches and offshoots of original Ryu practising a variation of the original style. Also some Seitei Iaido practitioners have mixed their basics to produce an unbelievable mishmash of movements. One can join a Japanese Iaido Dojo to find that no one actually does Koryu. After all who needs it to pass Dan Grades? There are many Japanese and Western Iaidoka aware of this problem and are keen to differentiate between technique and basics. In reading this book one can begin to separate many of the facets. 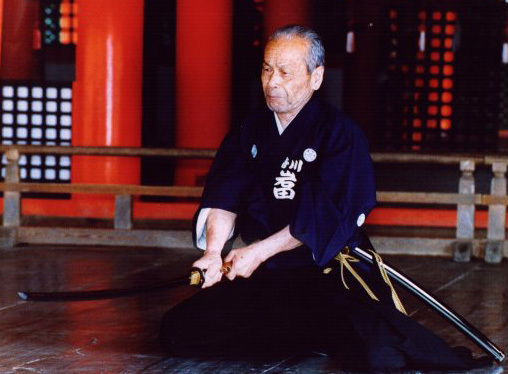 Nowadays a lot of the Japanese Sensei who can clearly separate Iaido, Iai-Jutsu, Batto-Jutsu are in their eighties. Another ten years or so will see an even more rapid decline in the knowledge of the sword unless we take advantage and learn from their teachings. One only has to pick up Kendo Nippon or Kendo Jidai magazines to see that one of the senior most respected Sensei of the Ryu is Iwata Norikazu Hanshi, holder of two Menkyo Kaiden and a Iaido Hanshi. Born in 1913 in Kochi. He studied under the students of Oh-e Masamichi. Fukui Harumasa, Suzue Yoshishige, Takaoka Den. At University he continued his studies under Mori Shigeki Sensei. He was given generous instruction by Yamamoto Takuji from August 1957 for a period of twenty years. He has written two books on Iaido, and is featured monthly in Kendo Nippon. His tuition and writings are superb as he relates to us his teachers guidance and that of Oh-e Masamichi (Roshu) the founder of Muso Jikiden Eishin Ryu. Master Oh-e studied Eishin Ryu Shimomura Ha and became the 15th Headmaster. Although he left that school and joined the Tanimura Ha and took over as the 17th Headmaster. No one knows his actual reason for doing this. Nevertheless I would like to put forward my own opinions. 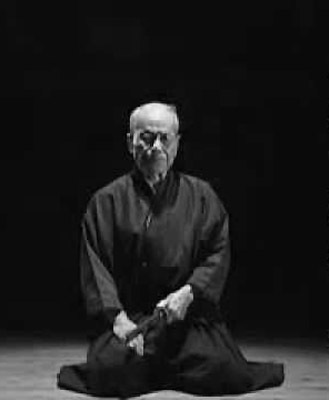 Master Oh-e was a Kendo instructor. Therefore the Iai posture was comparable - Facing straight forward. I think this was his primary posture. a) The Shimomura Ha has more hand and finger techniques compared to Tanimura Ha. b) This style permits more body twisting movements than Jikiden. c) The twisting of the body and the timing of Noto + footwork activity is more assiduous than Jikiden and is very technical. Because of these reasons the method of Oh-e Sensei, Face to Face became more popular with students who had originally started with Kendo. The fundamental standing posture in Kendo (Chudan no Kamae) is to keep the head and shoulders square on. (Not to be confused with modern day Kendo with the body and both feet facing forward). I believe that the basic methods of Oh-e were based on this. Master Oh-e also experienced real battle (a political war at Hamaguri Gomon) The Clam Gate War in Kyoto at the end of the Tokugawa era. This is why his technique seemed so realistic.